The Indian Navy launched the third Scorpene-class submarine INS Karanj at Mazagon Dock Shipbuilders Limited (MDL) in Mumbai, Maharashtra. 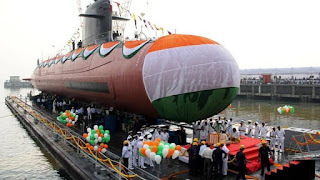 The Indian Navy’s third state-of-the-art Scorpene class submarine, INS Karanj, was launched by Reena Lanba, wife of Chief of Naval Staff Admiral Sunil Lanba. It is named after the earlier Kalvari class INS Karanj, which was decommissioned in 2003. It was commissioned in Indian Navy on September 4, 1969 and was retired on August 1, 2003. Karanj had served the nation for 34 years and also took part in 1971 operations. Karanj is the third of the six Scorpene-class submarines being built by MDL under the Project 75 programme. The other two are INS Kalvari and Khandari. The first one, INS Kalvari, was commissioned on December 14 last year whereas the second one, Khandari, has already been launched and is undergoing sea trials. The Scorpene submarines are a primary modernisation requirement of the Indian Navy as currently it is having an ageing submarine fleet, and that too when the Chinese navy has a growing presence in the Indian Ocean. Six Scorpene class submarines are being built under Project 75 by the Mazagon Dock Shipbuilders Limited (MDSL), Mumbai, under a $3.75 billion technology transfer signed in October 2005 with the Naval Group of France. Therefore the ships are being built in collaboration with the French shipbuilding major Naval Group formerly known as DCNS. The programme has been delayed by four years due to construction delays. The Scorpene class is the Navy’s first modern conventional submarine series in almost two decades, since INS Sindhushastra was procured from Russia in July 2000. All the submarines are due to be inducted gradually into the Indian Navy by 2020. INS Karanj includes superior stealth and ability to launch crippling attacks with precision-guided weapons. These stealth features give it an invulnerability, unmatched by most submarines. The attacks can be carried out with torpedoes while submerged or on the surface -- in all war theatres including the tropics, giving it an unmatched invulnerability. For self-defence, it has mobile anti-torpedo decoys. It will undergo rigorous tests for the next one year before it is commissioned.